TeamSQL is a simple, effortless, extensible and completely free to download Redshift client. You can download TeamSQL for Redshift for Mac OS, Windows or Linux. We encourage Amazon Redshift users to migrate to DataRow, our web-based query and cluster management tool specifically designed for Amazon Redshift. Store & Share In The Cloud: With TeamSQL for Redshift, it’s easy to collaborate with your colleagues using saved Redshift queries. Keep, organize, and share your Redshift queries using your private cloud storage. Visualize Business Data In Charts: You can easily visualize your data in TeamSQL for Redshift by creating bar, area, line, pie, scatter, funnel, and bullet charts, as well as heat maps, using the data you return from your database. You don't need to export your data in Redshift anymore to a separate data visualization or reporting tool. Executed Redshift Query History: When you're working in a TeamSQL for Redshift query editor window, you'll find a list of Redshift queries that you've run. Not only can you review the work you've done, you can easily reuse the code. Keep Safe Your Data With QuerySense: TeamSQL for Redshift has some unique features not present in many modern Redshift clients. One of them is a feature called QuerySense which consists in detect any potential data destroy Redshift statement and open a windows to warn you and ask for confirmation. Inline Editing: TeamSQL supports inline editing of returned data for all your data tables. With inline editing, you can rapidly edit your table via; create, update, delete. Redshift Code Snippets: Users of Redshift also have snippets available for use, including those for the CRUD (create, read, update, and delete) commands. Explore the Redshift Snippet List. Teams & Collaboration: You can create teams, making it easy for you to share your TeamSQL for Redshift folders or your queries with a group of people all at once. Most importantly, all of this happens without you having to export your Redshift data and send it (followed by the recipient importing the data). Search in Database Items: You can use TeamSQL for Redshift's powerful search functionality to find what you need. In addition to running an actual search, you can filter your tables, views, stored procedures and functions. Table Structure Viewer: Easily view the structure of your Redshift data table. See the total number of columns for the table, the name of the column, the data type it accepts, whether it's a nullable field or not, and any additional details (such as whether the data is signed). 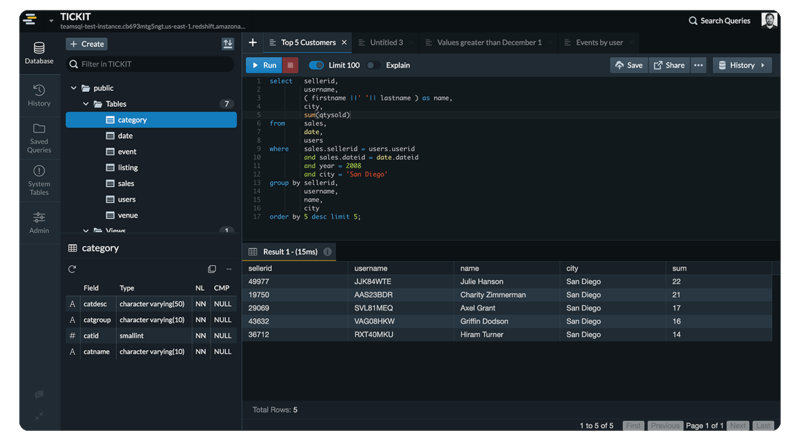 Functional Data Grid: TeamSQL for Redshift's data grid is a powerful part of the client. In addition to displaying the data that you return with your queries, you can use it as you would a spreadsheet -- sort and filter your data without modifying your query. Supported Database Engines: Download TeamSQL for Redshift and also work with multiple database engines, including: BigQuery, Microsoft's SQL Server, MySQL, PostgreSQL, Redis and Oracle. TeamSQL is completely free to download and use with full features.